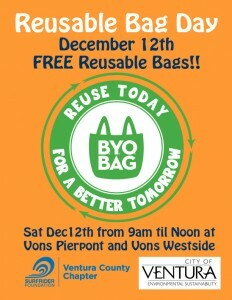 Every day should be Reusable Bag Day and Surfrider Ventura plans to remind everyone on Saturday, December 12th with our annual Reusable Dag Day! Reusable Bag Day is an educational grassroots event hosted by the Surfrider Foundation Ventura County Chapter along with local community groups. We are asking holiday shoppers and retailers to forgo single-use, plastic shopping bags in favor of reusable bags to help protect the oceans and Venura’s beauty one reusable bag at a time. 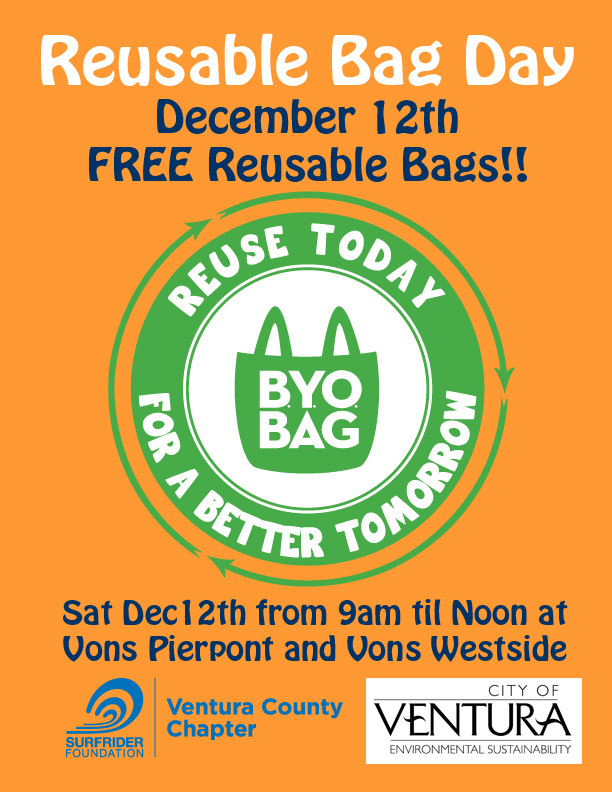 Surfrider Foundation and City of Ventura Environmental Sustainability Division volunteers will be out front at the Vons on Main St. and Ventura Ave. near the Ventura River from 10am-Noon on Saturday December 12th handing out free reusable bags to shoppers! Get your reusable bags now and remember to vote YES on the statewide plastic bag ban referendum item in November 2016. Plastic bag litter is one of many issues around Ventura that impacts the ocean and reusable bags help to address TMDL (total maximum daily load) limits set by the EPA. Cities and residential neighborhoods create concentrated levels of bacteria (pet waste), nitrates (herbicides & pesticides), litter, and other unnaturally occurring contaminates that can enter our stormdrains and waterways. To mitigate this, there are stormwater pollution prevention best management practices to help keep our waterways clean and free of these pollutants such as choosing reusable bags to help reduce litter. DO YOU OR YOUR BUSINESS HAVE AN EXCESS SUPPLY OF REUSABLE BAGS? Email vicechair@ventura.surfrider.org and we can pick them up! Would you like to help hand out bags? Please email vicechair@ventura.surfrider.org. You can also pitch in at the final Surfrider litter cleanup for 2015 at Surfers Point from 9am-Noon on Saturday December 19th. Meet on the promenade near the Crowne Plaza hotel, look for the Surfrider tent to sign in. Visit www.facebook.com/venturasurfrider for updates on all of these events and more.